I'm not exactly renowned for being sensible with money, I do purchase items especially those of the beauty type on a whim and often live to regret such decision. However I am pretty thrifty when it comes to "boring" beauty essentials and will not pay over £1 for a whole number of products. If you are looking to save a little money without denying yourself the essentials, then perhaps scaling back and spending less on a few or all of the below products could help? As a side note seriously, what did we do before the Poundshop took over the UK high street? Kirby/Bobby/Hair Grips - I refuse point blank to buy my hair grips from anywhere else other than the Poundshop (I have never found them cheaper anywhere else) as I go through a pack on a weekly basis. As I use so many either due to my think hair bending them out of shape or simply misplacing them (seriously where do they all go? ), it doesn't make sense to pay more. The quality of the grips I have purchased within the Poundshop is as good as, if not better than Boots and Superdrug own brand offerings. Hair Ties - Much like the above hair grips I again snap, loose and bend hair ties out of shape daily and of course misplace more than I care to count. I tend to purchase most of my hair ties from Primark as they are kind on my hair (no metal closures), often come in realistic hair tones and for £1 you get more than your money's worth from a pack (over 30 hair ties). I can not recommend them enough. I also rate Primark for clear elastic/plastic hair bands to secure braids etc. Baby Wipes - In this aspect I am referring to those who use baby wipes to freshen the hands, as emergency face wipes and general cosmetic use - I entirely understand if Mothers pay more for higher quality, babies have different needs. If you use baby wipes for the aforementioned purposes then shop around, I would never pay more than £1 for glorified hand/surface wipes in my case. I only use baby wipes on the go so they are all but a throw away purchase in my case; I do tend to purchase Supermarket own brands as they tend to be the cheapest option or of course head to the Poundshop - can you really beat the Poundshop? Cotton Buds - They are cotton buds, need I say more? You can often find Cotton Buds in Supermarkets, Chemists and the likes of Boots and Superdrug really reasonably priced, more so own brands. As they all preform the exact same and are made identically, I say go for the cheapest box/pack and save yourself a few pence. I also recommend paying attention to the Baby aisles in Supermarkets etc as such ranges tend to be more reasonably priced in comparison to the products aimed at beauty use. Cotton Pads/Balls - Pretty much what I said above for Cotton Buds rings true for Cotton Pads and Balls, again they are more often not made the same and deliver identical results regardless of the price. 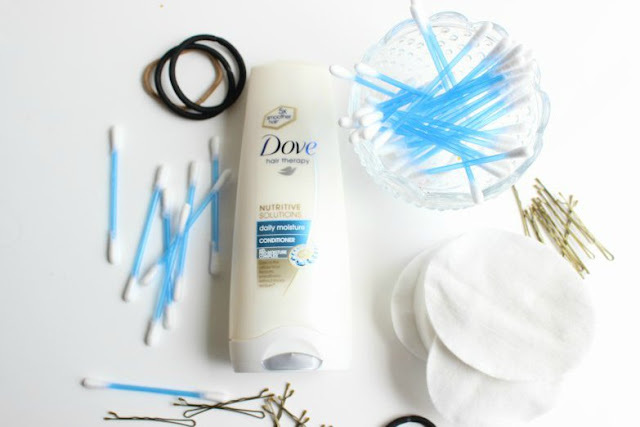 I personally prefer large cotton pads as I find they are easier to remove eye make-up from, believe it or not Boots tends to be the cheapest place in which to source the large Cotton Pads - on occasion I have also found them in the Poundshop. Hair Conditioner - As someone with longer than average hair, I go through a lot of conditioner and I mean a lot - almost a full 500ml bottle per wash. Such habit quickly adds up so I do pay close attention to price, I'd rather pay more for a hair masque than a basic conditioner. My top tip is to head to the Poundshop, I always find Dove, Pantene and Herbal Essences Shampoo and Conditioner in store and as they are only a £1 a bottle I can afford to stock up. What do you refuse to pay more for? Poundland do great cotton buds that are flat on one side and pointed on the other, so they are great for fixing eye make-up mistakes! This is super interesting. We're absolutely loving this post in the office today.We hate when cotton pad and buds cost an absolute fortune in some stores. They're essentials! Claire's bobby pins are also pretty well priced for a card of thirty. I don't know if you do this, but using a tic tac box to store bobby pins is a brilliant way to keep them all in one place when you're on the go! I agree on grips, I lose so many it's embarrassing and Primark is the place to go for them as they have grips for light and dark hair which I love. Shower gel is something I don't like spending a lot on and I can find good brands for £1 or less. I definitely agree with everything in this post, especially cotton buds, cotton pads and hair clips because I lose them all the time. I always seem to run out of conditioner frequently too. Poundland is a life saver when it comes to everyday essentials like this, Savers has some pretty good deals too! Primark FTW on hairbands. I've no idea where they all end up either! I like Tesco baby cotton buds, cheap and gentle. I'm the same - some basics just aren't worth paying more for! I've been totally shocked at how much cotton balls/cotton pads can cost. I watched a youtube for quite some time that bought hers at sephora and I think they were like 15$ a pack! For stuff like that I always head to wherever has the cheapest price/sale price and just buy a big bag. I will definitely be heading to the dollar store for hair ties though. I never even thought of that. They can be like $5 a pack at the drugstore!! And I lose them ALL the time! Thanks for the post! there is very little I will pay full price for lol, shampoo & Conditioner has to be on offer. Shower Gel has to be about £1 (im obsessed with original source and its always half price) Hair Masks, because my hair is epic its never anything other than normal. Wipes I am fussy over has to be Huggies, but they are always on offer too lol... I could go on and on, I am a cheapskate. Unless im anywhere near a beauty hall! I also buy baby shampoo from the poundshop, which I use for washing my makeup brushes. Does the job cheaply and is kind to the bristles! This is a great post! I have to agree, where do the bobby pins go?! I'm always wondering the pound shops for beauty bits, such a great place to pick up your essentials. Completely agree with these - anything you lose should be replaced easily. I think it's upright silly to pay more than one or two pounds for bobby pins, cotton puds and cotton pads. When I was living in England, Poundland was also the place where I went to find all the essential items for almost nothing! However, I can put a bit more cash for conditioners if they are really good. In another theme, I think that all types of female period protections should also be £1 - we buy them because we have to, they are essential and should cost us less than they actually do! Kirby grips. Yep. Where the h do they go?! There must be hundreds of these little things litered around my house somewhere! I'm the exact same, I refuse to pay more than £1 for the 'boring' items too. I pop into Wilkos or Poundland for cotton pads, shower gel (unless I'm feeling more fancy and want to use something super nice), baby shampoo for cleaning brushes!